BD Diesel Transmission - 6.7L 68RFE - Dezod Motorsports Inc - Home of the automotive performance enthusiast since 2002. 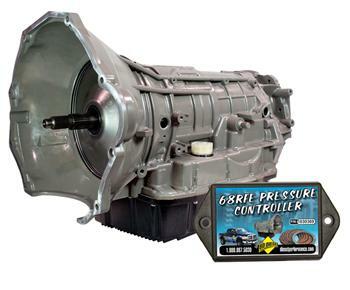 The 68RFE coupled behind the Dodge/Cummins 6.7L engine represents a new breed of transmission that was built to take on the high torque and horsepower of the Cummins engine but only at stock specs. There are many of those whom have already pushed the limits of their transmission with performance enhancements and hauling heavy loads that know all too well how much is too much for the 68RFE. BD transmissions are designed to take on what most 68RFE owners are looking for – responding with smooth sharp shifts to keep the engine in the torque range required. The electronic controls of the 68RFE and 6.7L Cummins combination makes the replacement of the transmission too complex for the back yard mechanic or small shop to perform – special scanners, gauges, tooling and flushing machines are required to get the job done right within the warranty specifications without instant failures occurring. BD has set up an expanding network of installation centers that can supply and install your new BD 68RFE transmission. BD’s 68RFE pumps have a new regulator valve design and along with new valve body separator plate and Pressure Control module can deliver up to 250 PSI clutch apply pressure providing 150% more holding force above stock to prevent clutch slippage. BD’s 68RFE Electronic Pressure Controller dynamically adjusts the hydraulic apply pressures based on accelerator pedal position (APPS) which is used in governing engine load and responsiveness through transmission gear selection. The modules dynamic control ramps up the much larger sweep right up to 250 PSI mainline pressure as needed dynamically. This is not accomplished with any other aftermarket engine tuner. All the clutch packs and drums have new machined designs with the maximum amount of heat/energy capacity in mind. Special machining has been done to the 2nd gear piston to incorporate additional thick-as-stock clutch fiber and steel plates. The 4th gear apply piston has been modified to accept a new heavier Billet retainer, and, a steel girdle is applied to strengthen the piston and give a broader apply area. The Low and Reverse sprag clutch with dog-bone style dawgs that bind and wedge themselves to destruction are replaced with a new BD exclusive, heavy duty constructed cam and roller style one-way clutch preventing these explosive failures. Each transmission is dyno tested and comes with BD’s Heavy Duty Deep Sump aluminum transmission pan to add strength to the case preventing flexing and internal oil leakage. We have matched BD’s proven Triple Torque Force Converter (sold seperately) to this application. Its one-piece billet cover prevents warping and trapezoid teeth hold the clutches that provide three times the holding power over stock units resulting in less friction wear and no rattling. BD’s own designed cast stator offers the ultimate torque multiplication and hits the target fluid coupling speed. The larger input shaft of the 68RFE will handle the shock of the Triple Torque Force 3-clutch engagement but if you are demanding more HP and with less risk, we recommend a Billet Input shaft – broken shafts are not covered under the warranty program. Ask for the ultimate 68RFE Diesel drivetrain performance package! Ask for a BD 68RFE! BD’s 68RFE transmission and converter package come with a 36-month limited warranty.